Check out the "Temptation" Themed Big Brother 19 House! CBS Press Release -- "Upon entering the house, Houseguests will be met with the ultimate symbol of temptation, a massive 13-foot-tall abstract apple tree, with LED lighting creating translucent “leaves” and over-sized apples. The other rooms in the house also carry out the theme. In a tribute to Power, one bedroom is designed around the idea of an old-school executive’s office. Over $6,500 framed and lighted $100 and $50 bills are hung on the green-tufted walls and a chandelier built from desk lamps hangs overhead. The linens are inspired by men’s pocket squares and typical office furniture has been transformed into custom-built beds. The kitchen, accented with classic architectural drawings and Greek key details, leads into the lounge, where a “wave” of crushed blue velvet with silver nail heads dominates the room. Adorning the wall behind a modern tufted chair are 396 massive green apples. There is a hint of Vanity in the bathroom, where 18 Venetian glass mirrors reflect every angle of the Houseguests. Upstairs, the Head of Household suite is pure Greed, sporting gold walls, gold floors, gold bricks and gold side tables. Real safety deposit boxes make up one wall of the room that is divided by an aquarium stocked with tropical fish. Also, the HOH bathroom features a 6-foot tall art deco chandelier." BIG BROTHER today announced this season’s new twist, “Summer of Temptation,” where the Houseguests will be challenged like never before as they embark on a season of tempting offers that could give them money, power and safety in the game. But, they will need to be careful, because for every temptation taken, there will be a consequence to face. 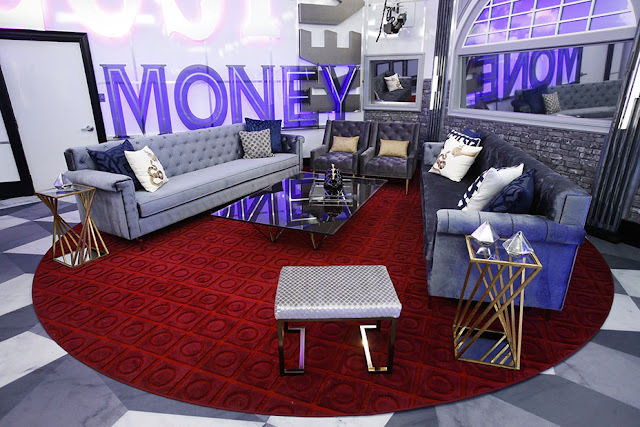 This season’s house reflects the temptation twist with words like Money and Revenge hanging on the wall, constantly reminding the Houseguests that the game never stops. The summer reality hit debuts with a two-night premiere event, Wednesday, June 28 (8:00-10:00 PM, ET/PT) and Thursday, June 29 (9:00-10:00 PM, ET/PT) on the CBS Television Network. In the premiere episode, Houseguests will face a BIG BROTHER first as they encounter tempting offers for money, power and safety that could change the course of the game on the very first night. In addition to the Twists being revealed during the two-hour premiere, a new twist, the “Den of Temptation,” will be unveiled in the first Sunday episode, July 2 (8:00-9:00 PM, ET/PT). America will vote on which Houseguest they would like to send into the “Den of Temptation” to be enticed by a potentially game-changing offer. But it’s always a game of risk vs. reward, as every temptation will unleash a consequence on the house. 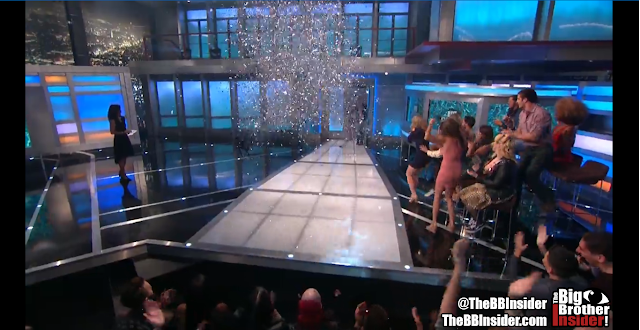 Following the two-night premiere, BIG BROTHER will air Sundays (8:00-9:00 PM, ET/PT), beginning July 2; Wednesdays (8:00-9:00 PM, ET/PT), beginning July 5; and Thursdays (9:00-10:00 PM, live ET/delayed PT), beginning July 6, featuring the live eviction show hosted by Julie Chen. CBS announced today 16 Houseguests who will embark on a new season of BIG BROTHER. This season’s cast includes a government engineer, a rodeo clown, a microbiologist and a cosplay artist, among others. CBS’ summer reality hit debuts with a two-night premiere event, Wednesday, June 28 (8:00-10:00 PM, ET/PT), and Thursday, June 29 (9:00-10:00 PM, ET/PT), on the CBS Television Network. Julie Chen returns as the host of the hit summer series. CBS All Access will give subscribers the opportunity to meet the Houseguests before anyone else via a live stream of their first interviews beginning this morning at 8:00 AM, PT/11:00 AM, ET. CBS All Access subscribers can watch the live stream online at CBS.com or the CBS App for iOS, Android and Windows 10, and on connected devices, including Roku Players, Apple TV, Chromecast, Android TV, Xbox One, PlayStation 4 and Fire TV. Wednesday, June 28th at 8pm with a Special 2-Hour Premiere!! Then on Thursday, June 29th at 9pm, tune-in again for second night of the premiere, but only for one hour. Big Brother will continue its schedule of airing on Sundays (8pm), Wednesdays (8pm), and Live Eviction Thursdays (9pm). Make sure to stay connected with us on Facebook & Twitter for all things BB19! Big Brother 19 is only four months, and approximately 110 days, away! That means that casting is gearing up, and you have an opportunity to earn that coveted key to the house. Robyn Kass, Big Brother's casting director since season 2, announced on Twitter that the casting team was about to "get this party started" for Big Brother's 19th season. Since that tweet, multiple dates and locations have been announced for open casting calls. Cities such as; Nashville, Chicago, Dallas, and Scottsdale have already received major details in regards to dates and locations. With casting calls starting as soon as two weeks away, it's important to be constantly checking BigBrotherCasting.TV for more cities and details. However, if you feel more comfortable auditioning from the comfort of your own home or if a Open Casting call isn't taking place near you, there is always still an online application. Online submissions require a video application with your submission. The Big Brother Casting website provides some great tips on how to make a good video, as well as video of tips on what not to do, featuring previous Big Brother houseguests. The online application deadline has been announced for Friday, May 5th. So, do you think you got what it takes to be a Big Brother Houseguest? Stop procrastinating and get out there and apply! We wish you the best of luck future houseguests. Find us on Facebook & Twitter for all things Big Brother!